I heard several things about Escapology prior to making the reservation for Antidote. 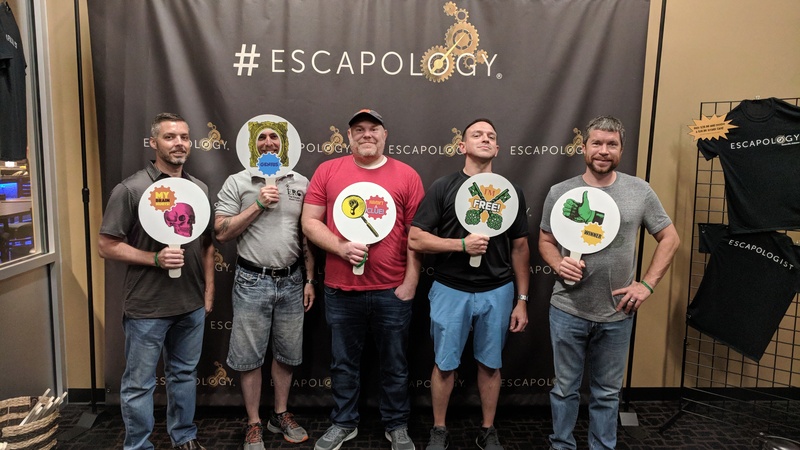 Escapology is one of the top-rated franchises in the country – from what I understand – so I was looking forward to coming here with my co-workers for a good team-building exercise. One of the group had done a single escape room (with me) prior. For the other three, this would be their first escape room (Escape Room Virgins – ERVs!). Let the shenanigans ensue! This is one of the more detailed stories I’ve ever encountered in escape room. The website and the briefing are identical. The video on their website is the same video you’ll see in the room. So if you want to get a good idea of what you’re getting yourself into, and whether or not you actually want to do the room, I suggest you watch the video on the website (or above). That said, you’re a team of scientists/investigators sent to the lab of Dr. Walter Brandt, one of the world’s foremost chemical weapons specialists. After getting the cold shoulder from the U.S. government, he decided to sell his services to the highest bidder. Your job is to find the only known antidote and bring it back. Unfortunately for you, one of your team members is a giant klutz and knocks several vials off the counter, at least one of which happened to contain the TS-51 virus… the one he was developing that can eradicate a population in a matter of hours. Your job now is to find the only antidote (as you were originally instructed to do), cure yourself, and exit the lab. All of this within an hour. As I said in the post video, this room was simple, yet deceptive. There’s not much in it, but what is there was well done. In retrospect, I can see how the record time is what it is. And I’m somewhat disappointed that I wasn’t able to help propel my team to a swift victory (and new leaderboard time). Like I said, the mission was essentially to find the antidote within the 60 minutes, so you and your team of investigators can cure yourselves, find the code to unlock the door, and exit the lab before it self-destructs. I feel like it’s been awhile since I’ve said this, so I’ll say it now, slightly begrudgingly. There were some new things in here. There were several key pads to unlock doors. There were several combination locks. There was even a scale. I’m not going to tell you what the scale is for, but it was well used. Oh and a glove box. Sounds stupid right? It isn’t. While yes, there were some combination locks as I said, the way to finding the combinations themselves was definitely unique to any of the room I’ve been in. Now, that may be because we’ve only been in a literal handful of scientifically-themed rooms, but – regardless – the puzzles were good, except for the actual riddle. Thankfully, Jeff was able to figure it out. I didn’t want to use a clue for a riddle. NOT. HAPPENING. When I said earlier that I could see why the record time was 25 minutes remaining, I say that because, looking back on the experience, we made a few stupid mistakes, mainly overlooking things. We found the last piece to the solution to the first lock after we had already opened it, for example. The solution to the TV was left where it was because we didn’t follow Rule #3 (shocker). Oh, and the vials…don’t get me started on those. None of us would have ever thought to do what we had to do with them. After talking to the manager of the facility (while watching the Caps destroy Tampa Bay in game 6 of the ECF), I learned that the facility that this room from Escapology is in bought into the Escapology escape room franchise. As such, they were given the specs for the room, but how it’s decorated is up to them. So, if you went to play Antidote at another Escapology facility, it may look completely different. Other than feeling like an idiot an times (because I always think that when we get a clue it’s going to be something ridiculous that we overlooked), it was a decent amount of fun. Several times things just clicked for me, and the ERVs in the group got to see how things go together. Again, helpful, but not insultingly so. I felt like there was a lot we just overlooked, and that pisses me off. I think it may be time for a mental reset. (Oh, and for getting yelled at by the GM for using my phone BECAUSE MY #*$!#@* FLASHLIGHT DIED!!?!?@#!@#! Final Thought: As I said above, I’m mildly disappointed in the fact that we neglected to follow the rules and just stupidly overlooked some things. Granted, there were 3 total newbs (ERV’s) and 1 novice, but still, that’s what I’m supposed be there for. Escapology is also a franchise (you can buy their stuff and they give you the puzzles and mechanisms but you “build” the room however you want). So if you want to stay away from non-custom built rooms, now you know. I would like, however, to try out all of their rooms, now that I know a little something about the quality.